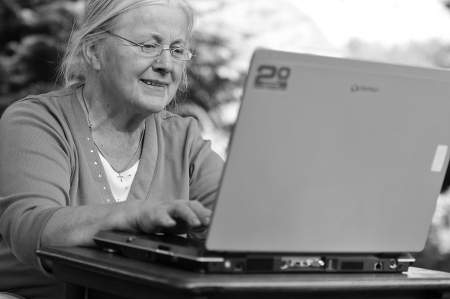 The research project WebDA aimed at supporting older users in the region Bonn-Rhine-Sieg to live at home independently as long as possible also when their memory skills decline. For that purpose, several services were developed, targeted at the different needs, ranging from users with mild cognitive impairments (MCI) up until users with moderate dementia. Advanced web services were created to improve memory performance, to provide structure to peoples’ everyday life, to counteract restlessness and to help to maintain social participation through training of communication skills. Since people affected by dementia often rely on the support of relatives as caregivers, WebDA also provides services that assist them in fulfilling their caring tasks. For the WebDA services, advanced technologies in the area of Web of Things were implemented. The services can adapt to the users' preferences by employing semantic-based user and device profiles. The concept of WebDA covers with its services the needs of users with a range of memory impairments, thus several prototypes of services were developed as described below. The focus of our team was to develop the Object Locator and the Action Planner. The Object Locator service is intended to allow users with dementia to locate lost objects in their homes autonomously. For localisation purposes, RFID-technology was employed. As input device the Object Locator uses a tablet. Its user interface is particularly designed to meet the requirements of users with dementia by composing a stimulus-reduced user interface with as few buttons as possible on the screen and by providing prompts to elicit proper user action for the navigation of the service. The multimodal user interface also supports the attention focussing process of users, as these skills typically decline in people afflicted with dementia. Additionally, the Object Locator can be accessed remotely, enabling caregivers to search for lost objects from their homes, either by themselves or together with their relatives. The Action Planner aims at supporting people afflicted with more severe forms of dementia. With the Action Planner, caring relatives can define actions with a rule editor to create context-aware reminders for daily living activities such as drinking water on a regular basis. Context-awareness implies not only time frames but also the location of a user can be specified, thus it could be defined that a reminder to drink shall only be triggered in case a user is located near the living-room table where the glass of water is placed. Besides this, event-triggered rules can be created, e.g., an SMS shall be sent to a caregiver in case restlessness is detected by constant wandering of a person between her bed and the chest of drawers in the sleeping room during the night. To allow the runtime evaluation of time- and location-aware rules, the Action Planner includes an RFID-based tracking system to locate a person in her home environment. User studies in WebDA have shown that the most feasible approach to create rules by the caregivers is to use an user interface that builds sentences with controlled natural language restrictions. Rule expressions are offered in preformulated natural sentences that can be manipulated by changing (pre)selected notions as “daily” in pop-up menus embedded in sentences. As immediate feedback on the impact of a user's choice, a rule summary is always provided on the top right side of the rule editor displaying the entire content of the selections (see screenshot below). To keep sentences with rule definitions as simple as possible, a rule of the Action Planner consists of the components: intended action (“what”), time frame (“when”) and location setting (“where”). Editing these components was split in tabs to avoid visual clutter. For caregivers with little computer literacy a wizard feature was additionally developed to define rules providing step-by-step guidance during the rule editing process. It can always be switched back and forth between the standard and the wizard view. Organizer: This service is particularly targeted to people with MCI up until mild dementia to support the management of their everyday life. The multimodal user interface allows to create reminders as well as executes messages with visual and auditory cues for appointments, events like the birthday of a grandchild and timed tasks such as taking medicine at a certain time. Biography-Tool: The Biography-Tool was developed to support reminiscence therapy for people with dementia. It allows caregivers to store pictures, videos, textual information and audios in individually meaningful categories, if possible, together with the family member they care for. The user interface accommodates the needs of users with declining memory skills and enables older people suffering from dementia to operate this service autonomously and select, e.g., pieces of music they like to listen to or pictures of a trip they enjoy to watch. Training software: To provide cognitive stimulation we developed a service that includes different exercises to foster memory and communication skills. The content of the exercises is tailored to personal interests and the level of difficulty adjusts itself to the individual skill level. Each training session includes units with music and easy to do exercises for relaxation. The training software can be used for independent training and as shared activity with caregivers. Home Emergency Call System: This system includes a mobile device for video communication carried by users with dementia which supports detection of emergency situations and can help to ease anxiety, provoked for instance by a bill that has arrived by mail. By pushing a button on the mobile device a telephone call is initiated to a predefined telephone number of a caregiver. Once connected a camera incorporated in the mobile device allows caregivers to view, for example, the bill to find out about its correctness in collaboration with the user. The camera can also be used to disburden other care tasks. For instance, it is possible to have a shared view into the refrigerator and discuss what groceries the caregiver should buy before the next visit. Information portal: During the project an information portal was developed that offered information about dementia in general. The portal also listed contact points for counselling, treatment facilities and institutions or private companies offering care for people with dementia in the Bonn-Rhine-Sieg area. When the project ended, the information portal was taken over by the public health department of the city of Siegburg and the House of Care for Older People in Bonn (Haus der Bonner Altenpflege). The figure below presents an overview of all the project services.